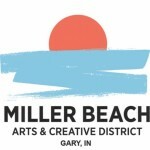 Miller Beach Arts & Creative District is a volunteer-based organization in Miller Beach, Gary, Indiana. MBACD created Made In Miller to bring awareness to all the wonderful projects the great people of Gary are doing here. MBACD manages two projects: The Marshall J. Gardner Center for the Arts and the Miller Beach Farmers Market.